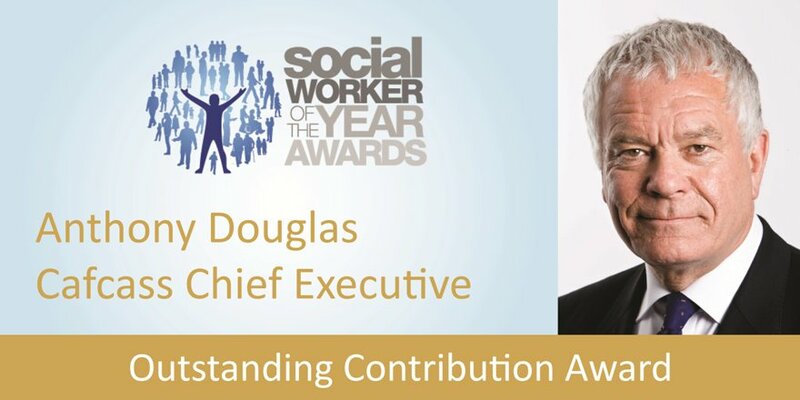 We are pleased to share the news that our Chief Executive Anthony Douglas CBE received the Outstanding Contribution award on Friday night at the Social Worker of the Year awards (SWOTY). Selected by the Social Work Awards Board, the commendation is reserved for individuals who have made the biggest contribution to improving the reputation of social work. The award was presented to Anthony by Beverley Williams MBE, independent social worker and founder of the SWOTY awards. She, alongside Ashley John-Baptiste, care leaver and BBC presenter, and Peter Hay, trustee of Community Integrated Care, longstanding Board Member for the Social Care Institute for Excellence (SCIE) and Chair of the SWOTY Board, commended Anthony’s role in bringing about “positive change” during his 40 plus years in social work. Their accolades talked of Anthony as “a forever social worker”, “a moral compass centred on children” and “a credit to the social work profession,” who seeks “improvement not glory.” A moving video tribute from colleagues across the family justice and social work sector, including Rt Hon Sir Andrew McFarlane, President of the Family Division, Edward Timpson CBE, our Cafcass Chair and members of the FJYPB, was then played.